Applies effortlessly; Creates a semi-matte finish; Guards skin against free-radical damage with its creamy texture; Soothes and softens lips with chamomile extract. 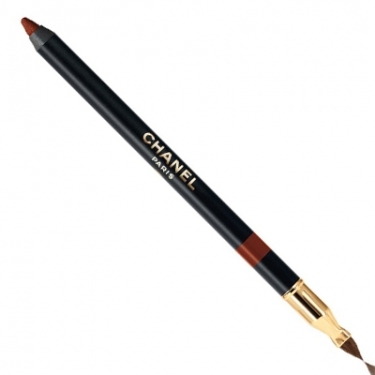 Le Crayon Lèvres is a lip contour for a precise makeup and a perfect finish. Defines and outlines the desired contour of your lips, emphasizing or correcting their shape whilst providing a semi-matte finish. This creamy textured formula contains highly purified and silicones for ease of application and lasting hold. Plus chamomile extract helps soothe and soften your lips and vitamin E derivates shields your skin against free radicals. Mademoiselle Coco Chanel revolutionized the constrained fashion and feminine style of the 20th century. Considered a stronghold of early 20's feminist movement, Coco Chanel created an elegant timeless fashion design that endures up to the present day. Chanel is elegance and comfort. An eternal style, forever and ever! To know the world-renowned brand Chanel, it is vital to meet its founder. The French fashion designer who later become a symbol of a social change and female role in society, played with charm and simplicity her own way of survival. Mythomaniac from poor family, Gabrielle never admitted her lower-class background. Only after her death in 1971, the true facts of her life were disclosed to the public. Gabrielle was born on the 19th of August 1883, in the small town of Saumur. At the age of 6 her mother died and Albert Chanel, Gabrielle’s father, sent her to an orphanage in Auvergne where she lived until 18. However, the simple quite life of a small interior town did not fulfill Chanel’s urges. She later worked as a shop assistant, seamstress and she had also aspirations for a stage career singing in a cabaret. Among others she sang the song ‘Qui qu’a vu Coco dans le trocadero?’. That is why Gabrielle Bonheur Chanel is better known as Coco Chanel. Her simple tailoring fascinated the public and in 1913, before World War I, opened two boutiques in Deauville and Paris. Her style was distinctly sporty yet feminine in sharp contrast to the corset fashions popular some decades earlier. In 1916, Maison Chanel was established at 31, rue Cambon in Paris – still the company's headquarters. Coco believed that there were too many men at fashion world who did not know how to give comfort to women. Therefore, her relaxed and casual look liberated women from the constraints of tight corsets and conservative outfits. As Chanel would say ‘There are no ugly woman in the world, just lazy ones!’. Based on this thinking she tried to reach the greatest number of women with elegant straight tailoring. She did not care if other fashion designers would copy her style because she just enjoyed women wearing her creations. Coco Chanel power to dictate fashion was so enormous that ever since a bronzed Coco Chanel came back from a Mediterranean vacation in the 1920s and made the tan the hottest fashion accessory; everyone has been going ga-ga over golden skin. Line and define lips with pencil, then apply lipstick with the brush. For a more matte effect, color the whole lip area with the crayon, then blend with the brush. Ideal for making thin lips look fuller, or for minimizing lips that are too full.